You want your wedding day of celebrationIt was perfect? And do everything possible for that: choose the best wedding dress, do cosmetic procedures and pick the best restaurant. 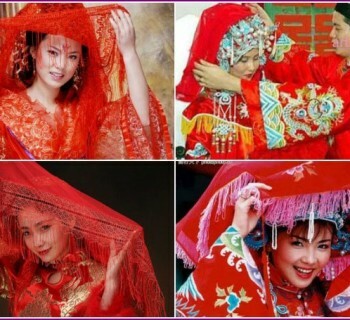 In addition to dresses and shoes often decorated with the image of the bride veil. What do you prefer: the classic headdress or a standard solution? If your choice fell on the second answer, think about how to replace the veil, that it was nice and bright. Let's face it. Is there an alternative wedding veil? The unequivocal answer to this question - yes. 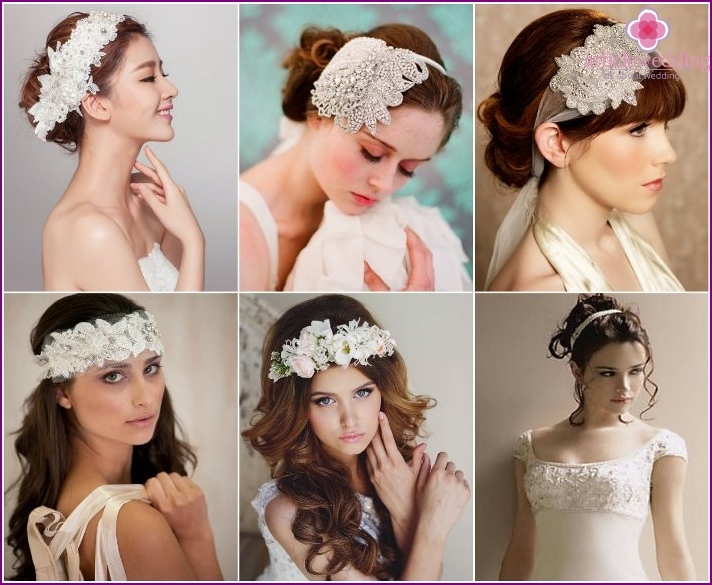 There are many products that you can choose instead of the standard head-dress of the bride. Before the wedding veil was used primarily as decoration and talisman, but also to cover the exposed parts of the body. In today's image of the bride wedding veil standard it can be easily replaced with a beautiful decoration, hat, wreath, lace, bandage. decorating style should be suited to the dress,shoes, bridal bouquet and boutonniere. It looks bad wreath of flowers on her head in combination with a bouquet of artificial butterflies. In the balance to be: better in this case to decorate the hair, for example, a clip with a butterfly. Color bridal jewelry should not be alone. If you decide to use red ribbons in her hair, let it be repeated in the shoes, bouquet or girdle dress. This combination will be organic. Do not forget to align its appearance withway Groom. If you decide not to take standard options, replace the veil - offer a future spouse to choose a butterfly instead of a tie or even go on holiday without it. If a family tradition to choose a wedding bandress without veil, you can change the image after the official ceremony. Suppose that at the wedding and you'll be painting with his head covered, and then it will remove the hairdresser and beautifully attach a wreath or other lightweight accessory. In drawing up the wedding image always consider not only the appearance, but also comfortable things. In the best day you should not disturb anything. If at the time of preparation for the wedding orthe triumph of something going wrong, as we (disintegrate hair, lost some accessory), do not worry, every bride is beautiful on this day, in spite of the little things. The main thing is that the soul was calm and peaceful. If you consider yourself a creative person,come up with a wedding image for themselves. Pick up a sheet and a pencil and vividly convey what you want in your dress. Perhaps, in the studio will be able to fulfill your request and poshyut dream hat or veil, which you dreamed the night before. Do not be afraid to experiment, if you decide not to use a standard solution in the form of a veil. Suppose that on your head in the auspicious day would be a work of art. A couple of decades ago, the royal or approximateto the family it could not think that in addition to the wedding veil will be allowed to use anything else. However, if this accessory is used together with the veil. And now, this combination looks quite organically. The main thing is when you use both of bridal jewelry - do not overdo it and do not look like a Christmas tree. The veil may well complement the standard or unusual way. It looks wonderful combination of the hat andshort wedding dress. But you can combine the veil and long dresses. It is more worn on one side, but to cover the part of the eye. Veil serves as the veil may have a little skirt from behind. Accessory must be made of a material which is taken to the main board (but not necessarily). It is important that the color of fog combined with the dress. 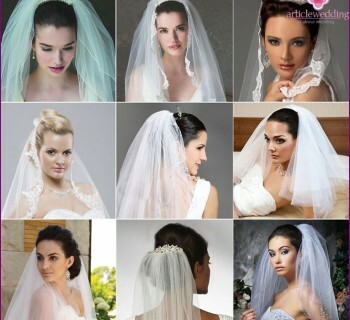 Among the types of wedding veils have round,square or asymmetric. The first and the second form can be a small cap with a long grid covering the eyes. Asymmetric veils - a flying fancy design, they can be of any kind. Such products can be combined tulle, lace, satin, feathers, crystals, stones. There are no restrictions on the choice of the veil, rely on their prenuptial flair. This elegant accessory for the head moregain popularity. Earlier hat liked to wear women who walked down the aisle is not the first time. Now, this rule has lost its strength, and headgear may be used even young girls. 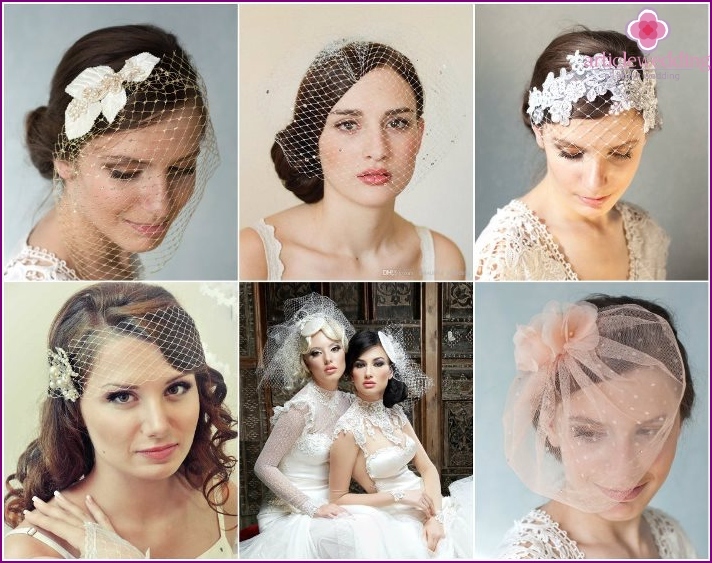 The basic rule of wedding hat - selecting it in terms of dress. If the main outfit bulky, with a train, a variety of jewelry, the cap has to be small. And the more the better to combine with the modest dress. Wedding hat is different from an ordinary hat. It is sometimes not completely worn down. It is allowed to mount the studs or pins as the non-functional accessory. Although some ladies this hat can save from the sweltering heat. 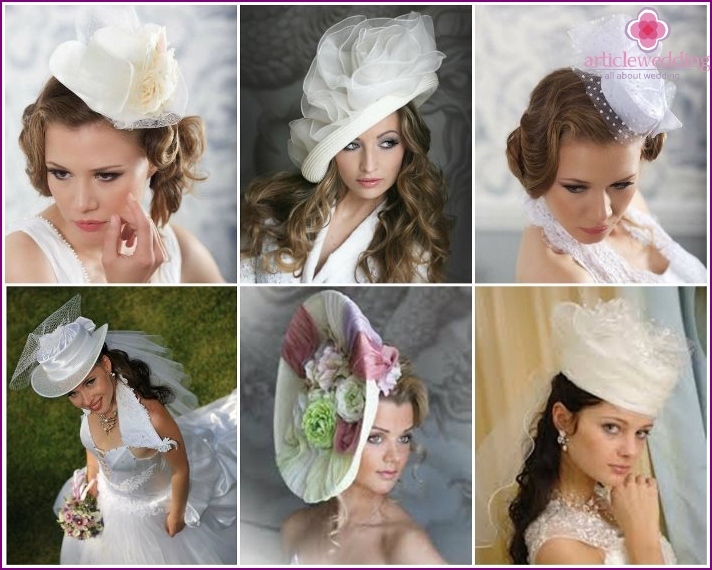 During the summer, the demand for wedding hats increases. And in the winter because of the wind they are used very rarely. This classic wedding decoration popularamong brides because it is used as a veil, and without it. Tiara - This hair ornament in the form of strips, and the tiara is a semi-circle or oval shape. If the veil is used, then this accessory should be gentle, almost imperceptible. If you long for the cover of the head and the hair is missing, you should choose a massive wedding tiara. Tiara or crown made of rhinestones and gemstonesSwarovski or jewelery. It depends on the budget. Very rarely these accessories combine ribbons or fabric elements. 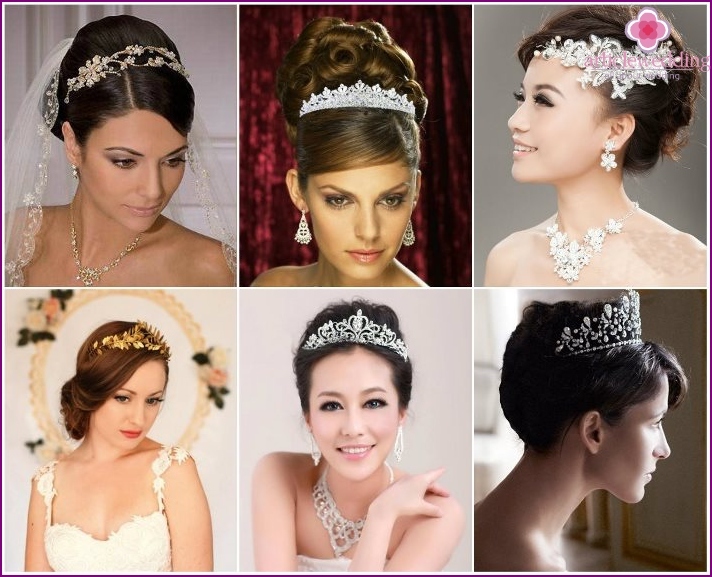 Since the wedding tiara symbolizes wealth, it is made from expensive materials. It should pick up a necklace, earrings, bracelet. There also need to be careful not to become like a Christmas tree. To properly use this type ofaccessories - take a look at her wedding dress. What type of fabric lace or satin whether it is used there? Answering these questions will be easier to select the type of accessory. It is important to combine the lace in her hair and on her dress. That is why such an accessory is selected directly in a wedding studio - there you will immediately realize that the image is not so. 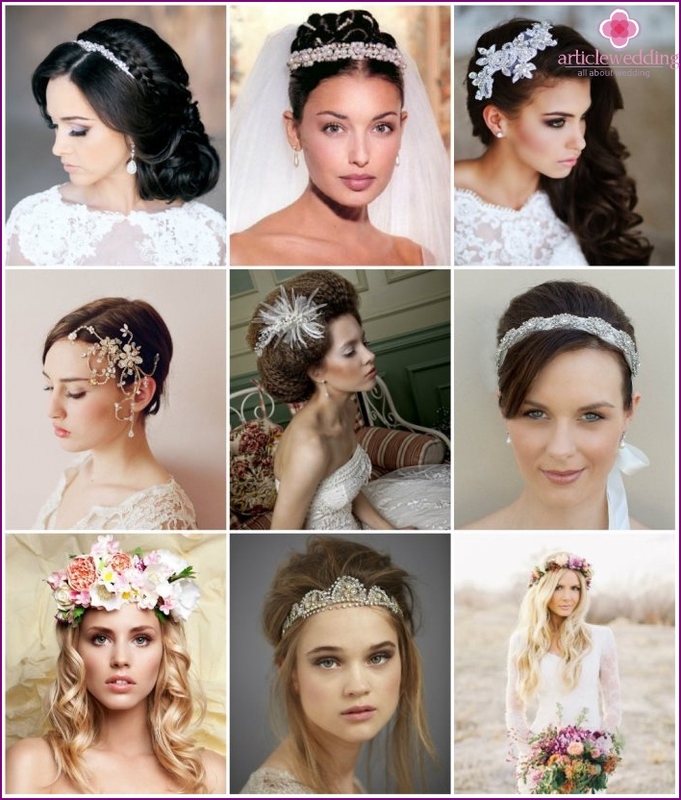 Lace became topom among hair accessories in20th century. It really looks like a very elegant with a veil, and on their own. Lace tape and used in the olden days. Often picked multicolored set to married life was fun. Now it is better to choose satin strips in tone dress. If it has colored belts or bows, this format is to pick up and hair ribbon. The main rule of the choice of colors in the weddingcelebration - Plant view of the bride's bouquet should be repeated in the buttonhole on hair accessories. Among the colors that can be used for such ornaments, secrete large and small roses, peony, chrysanthemum, iris. They are fixed easily, long look fresh. Special new trend - wild flowers, they like to combine with a very modest fee and, conversely, very expensive. How to use the wreath, if the bride's bouquetIt does not consist of fresh flowers? Currently popular wedding jewelry with crystals, stones, ruffled paper, butterflies, so you can make the same emphasis on the head. The main task here - to take something from the dress and intersperse hair. No matter what the bouquet - live or artificial. The main thing that decoration in her hair and a bouquet echoed in at least one element. When the bride's wedding contains manydecorations on the head is to provide a small addition. In this case, the veil is really not relevant, it is better to take a simple Clip. She can repeat patterns dress or combine the colors of accessories. The main thing that was present in the form of unobtrusive. This kind of wedding jewelry you can make to order or buy in the store. 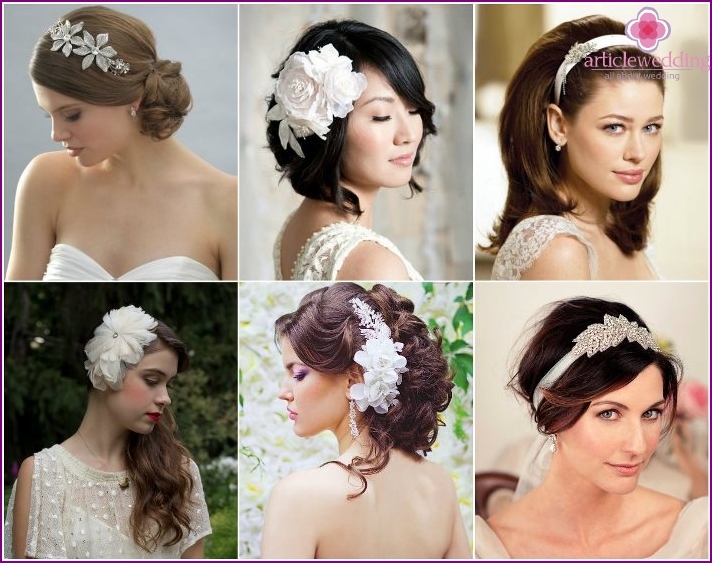 But attention should be paid to the method of attachment: if you can attach a beautiful hairpin to choose a hairstyle. Often the bride's make yourself unbelievable masterpiecesof hair. It can be high greased back hair or hairstyles that visually lengthen growth. In this case, the use of a wedding rim with rhinestones to accentuate hairstyles quite appropriate. The whole image of the bride will be harmonious. Such rim you can make your own by attaching gems and crystals on a satin ribbon. His creations are always more and more pleasant to wear. This option is only suitable for veryrisky brides or those who have limited faith. In many cultures women are forbidden to walk with their heads uncovered, and the wedding is no exception. In this case, the veil is easily replaced with a handkerchief, which will perform the same function. Color may be not only white. In the East, there are blue, green, red wedding dresses. Scarf can be in tone along the main or more pastel. Attach these hats, you must usepins or studs. But often they are connected with a beautiful wedding rims of rhinestones and gemstones. It goes well with all the dress, appearance groom, bouquet. To make the right choice, try to shop at the same time to try a scarf with the rim. There are models with bandages ready to mount, which can also be the perfect complement of the image. When purchasing an accessory for the head, whichreplace the standard cloak, note the color of their hair, their density and future hairstyle. This will allow the most long-awaited day not to think about the little things. White is known, any woman goes. But if the accessory will combine several colors, be careful with his selection. 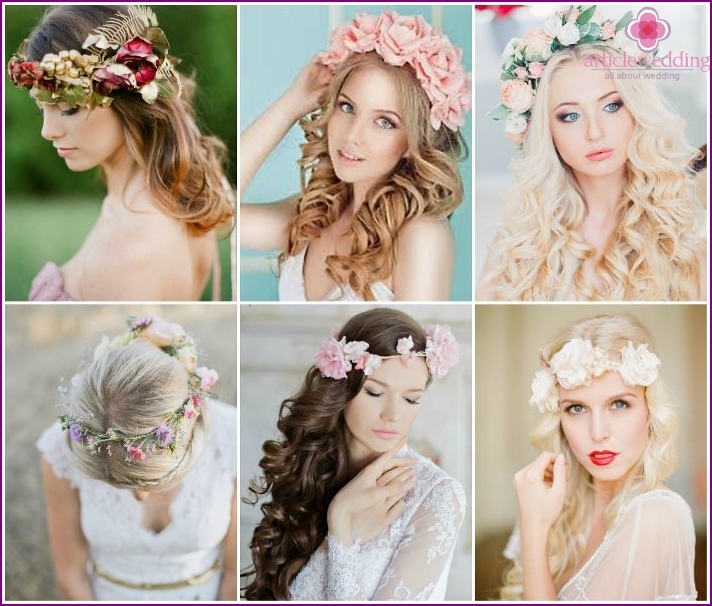 You are faster and easier to identify with the wedding decoration for hair, if you can see a photo collection of the most original, beautiful ideas headdress without veils. Wedding glasses: both emphasize the solemnity of the moment?